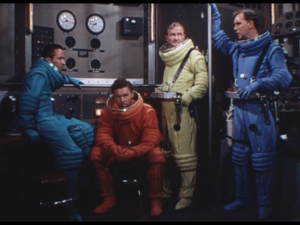 As you would expect from the title, it's about the first trip to the moon, based on a story by Robert A. Heinlein, in which our four gallant heroes outwit government interference to make their voyage (which also from context appears to be the first manned spaceflight). 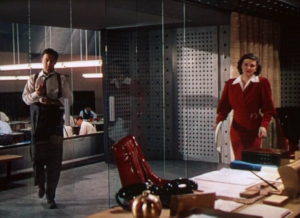 To get my inevitable complaint out of the way first, absolutely everyone in the film is white, and there are only three women with speaking parts, two of whom (the secretary in the first picture below, who I have not been able to identify, and Grace Stafford performing Woody Woodpecker for the first time in her long career) don't even get credited. We met Erin O'Brien-Moore (here playing a gallant astronaut wife) previously as Nana in The Life of Emile Zola, thirteen years ago. 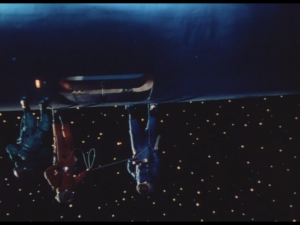 The most famous portrayal of the first landing on the Moon is of course the real thing in 1969. 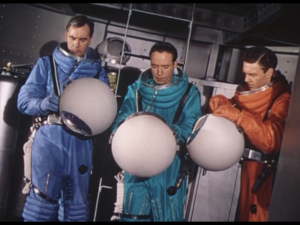 As is well-known, it was a government-funded effort rather than privately financed; the mission was planned as a lunar orbit rendezvous rather than a direct flight; the space capsules were pretty cramped affairs rather than the spacious workshop of the film; and there were three astronauts rather than four, of whom only two landed. (Also the moon's surface is in fact a rocky, dusty desert rather than looking like a dried lake bed.) However, some things just cannot be left out; you have the excitement of the first footfall itself, the thrill of looking back at Earth from space, and the difficulties of free fall and low gravity. Most of this goes back at least to Jules Verne. The most entertaining bit is when, as noted above, Woody Woodpecker makes an appearance explaining the lunar mission to investors. To keep the drama going after take-off, two technical crises are manufactured for our heroes to solve. Both of these seem rather silly by the standards of today's carefully planned missions. 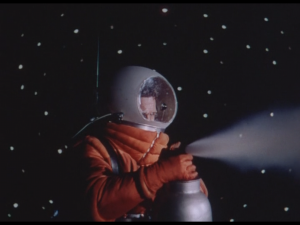 First, the radio antenna gets stuck because its lubrication froze in vacuum, and in the course of a spacewalk (in which everyone perilously participates) one of the crew starts drifting away (but is saved). 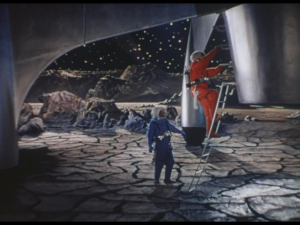 Second, once they are on the Moon it turns out that the ship is too heavy to lift off again, and it looks as if one of the crew may have to stay on the Moon forever (but a solution is found). 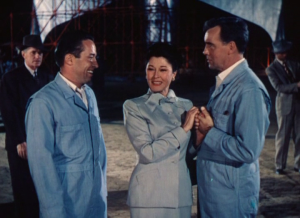 Extra laughs are provided by the fact that the radio operator is a blue-collar chap from Brooklyn, contrasting with the other posher astronauts. 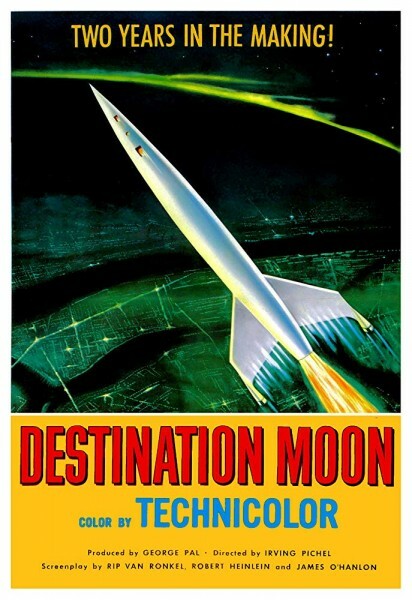 I can see why Hugo voters chose this in 2001; it is somehow closer to the spirit if subsequent sf than any of the other finalists (except for Rocketship X-M which is a knock-off of Destination Moon). I strongly suspect that Harvey and Cinderella are better films, though. You can watch it on YouTube here (at least for now) or buy it here. 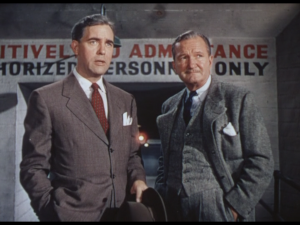 Next up in this sequence is The War of the Worlds (1953). But the power pile was unsealed and the ship was ready to go. Thirteen-fifteenths of its mass was water, ready to be flashed into incandescent steam by the atomic pile, to be thrown away at thirty thousand feet per second. It's typical enough Heinlein, not especially original or vivid but clearly substantial enough for a memorable film to be based on it.